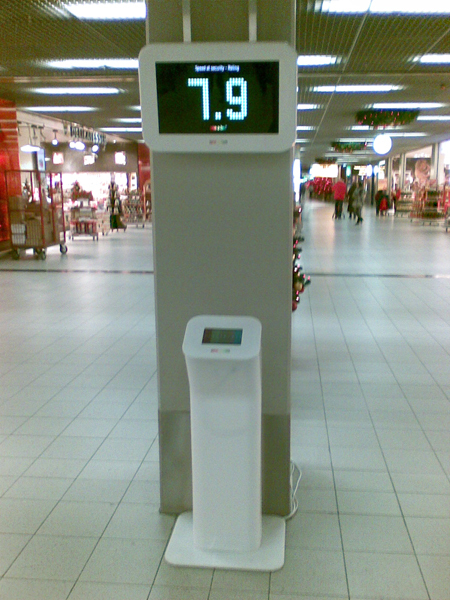 After passing the security control at Schiphol Airport (Amsterdam), I stumbled upon this interesting device. This device left me wondering about its true function. 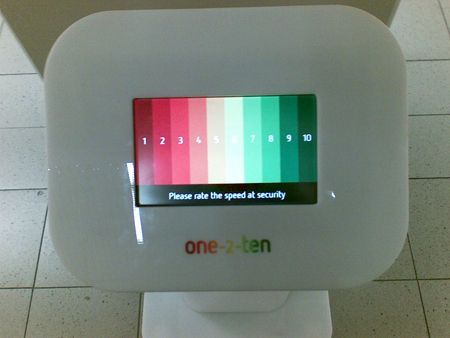 Of course, the obvious one is to gather feedback from the travelers on how quick the security control is working. But in an already very optimized process and with the current amount of security regulations is there really so much to be improved? So what is the meaning behind this little console? I believe it is « relief ». After you have spent time in a long queue, has been told to remove all your belongings and shoes, forced to expose your luggage and probably hand-searched as well, this interface is like your own little personal revenge. So that you walk away satisfied. Cet article a été publié le Jeudi 6 janvier 2011	et est classé dans Concept d'interface, Design, Humour, Interaction, Mobilité/Mobility.